“It takes money to make money.” People starting their own businesses, no matter how small, soon find out how true that saying is when setting up an office, developing a product, and launching marketing campaigns. On the other hand, it may seem as if the job-search world is only kind to people who are happy to follow a set path of advancement within their current fields. Most jobs require candidates to have relevant experience, leaving people who want to break into new fields feeling unqualified and stuck. Even enlisting the assistance of a recruiter may prove challenging, since the pros often use previous experience “keywords” to sort through resumes when working to fill positions. Completely changing your job or starting a business is a big shift, both financially and mentally. Here are some ways to make sure both you and your finances come out on top. The internet is full of inspiring stories about people who quit their jobs to, well, fill in the blank. Many of these stories are designed to get you to seize the day, and your new life, right now. What you may not know is exactly how much planning and grit it took those people to get where they are today. That couple living in a tiny house on wheels and living off the proceeds from their travel blog? They spent a year building their new home, selling their old digs, and growing their social media networks before hitting the road. That executive who opened his own restaurant has been cooking for friends and catering events on the side for years. And that waitress-turned-accountant worked the night shift and went to school during the day. The truth is, most people who successfully change careers prepare for months, or even years, before taking the plunge. It’s generally a slow ramp-up that can feel like you’re juggling two full-time jobs at the same time. While completely changing your career isn’t easy, your chances of success increase if you follow a plan. All those social media stories do get one thing right: It starts with a dream. Plenty of people fantasize about quitting their jobs to do something else at some point. 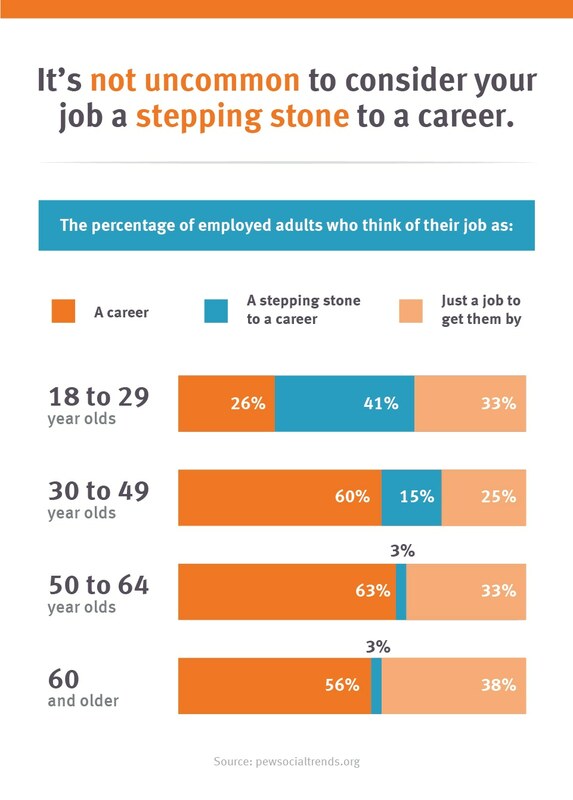 In fact, according to Pew Research Center, a full 30 percent of people say their jobs are just something to “get them by.” More and more people are opting for a career change, and it all starts with choosing a direction. When you choose yours, feel free to dream big. Write down what your life will look like, including where you’ll work, what your day will look like, and what you’ll do outside of work, once you achieve your goal. Let yourself get excited; you can reel yourself in later. Have a destination in mind? Good. Now it’s time to look at where you’re starting from. Assess your current finances, the market, and your skills. Start by making a list of all your expenses, income, and assets. If you don’t normally, spend at least three months taking careful stock of what comes in and what goes out. Vicki Robin, author of Your Money or Your Life, suggests categorizing each expense by how necessary it is. This is important, because whether you’re starting your own business or switching careers, you’ll likely see a pay cut, additional expenses, or a gap in your normal income schedule. If you can identify ways to cut unnecessary expenses, even for a little while, you’ll be able to fuel your change. According to a 2016 study by the Bureau of Labor Statistics, for example, in 2015, middle-class households spent an average of 41 percent of their food budget eating out. Is this one part of your budget where you could cut back and save money by cooking at home more often? Do you live in a tech center like Silicon Valley? A creative city like Austin? Or a foodie capital like New York? If your sights are set on software development, music, or opening a restaurant, you may have a lot of opportunities — or competition — where you are. A move may give you better chances of success. According to United Van Lines, for example, Washington D.C., Nebraska, and Rhode Island are the top three places job-seekers moved to in 2016. When researching potential markets for your desired career change, take a look at how much it would cost to move and live there. These are two important numbers for budgeting your transition. It’s easy to believe that starting a new career is just like joining the workforce for the first time. It isn’t, which is good news. Whether you feel fully qualified for your new field or not, you have more skills that can help you succeed than you did fresh out of school or at your first job. You may have leadership or team-building skills. Perhaps you know how to use certain computer programs or have consistently exercised the math parts of your brain for the last several years. Make a list of your skills, both hard and soft. Specifically, look for ways in which your experience may overlap with the requirements of a new job, or help prove your ability to successfully run a business, and pay attention to those. Once you evaluate where you are, it’s time to map out your destination. If you’ve ever changed jobs in your current field, you probably began your search by trolling job listings on job aggregator websites. If you want a job in a new field, this is still where you should begin, but primarily for research purposes. These websites can help you if you’re starting your own business, too: Focus on what CEOs and managers in your future field need. Get an idea of what kinds of credentials are generally required and how much experience you need. Don’t get bogged down if you can’t meet the requirements yet. You’ll get there. Combined, these realties are enough to make anyone feel defeated before they’ve even begun. But don’t worry: You aren’t doing a traditional job search. You can circumvent some of those hurdles. Do you lack certain qualifications to land the job or get the startup funding you need? Perhaps you need to add a stepping stone to your journey – one that helps you bridge the gap. Look for volunteer opportunities in your community or freelance for friends for a fee. Ask your new clients for a reference or testimonial to boost your credentials. Sometimes you don’t have to leave your current company to get additional experience. Let’s say you want to move from IT to marketing. You could get your feet wet by talking with the marketing manager and offering to help. Show your desire to learn and make the effort, and your name could come up next time there’s an opening in that department. Eighty-five percent of jobs are filled using networking. This is especially true for people amid a career change. People land great jobs when they convince a hiring manager they are the best candidate. Convincing a stranger of your qualifications with an emailed resume is a tall order, even if you have years of experience. Convincing a friend, cousin, neighbor, or the woman you sit next to at your neighborhood coffee shop each week in an actual conversation, however, may be much easier. Instead of being overwhelmed by all the requirements you see on job postings, pay attention to who’s posting the job and figure out how you can rub elbows with them. LinkedIn is a great resource, but you can also take a more direct route: Call the company and tell them you want to know more about what they do and how you can learn more. Could they use your pro-bono help in exchange for them showing you the ropes? Most people don’t decide to quit their day job overnight. In fact, 71 percent of people in the United States are unhappy or disengaged at work. For many, that’s because they feel stuck. They don’t see how they could take a pay cut or move themselves (or their families) in their search of a more satisfying career. The people who do change careers succeed because they believe they can, despite how tough it is to go to night school or tighten their financial belts. If you crunch the numbers and it all still seems impossible, you may consider taking out a personal loan to help ease your transition, assuming you maintain steady income in some way or want to use it to start a small business or side gig. Whatever you do, don’t give up. Completely changing your career is challenging, but with patience and the right planning, you can make it happen. Why not start today?